The Mid-Autumn Festival (中秋節), also known as the Moon Festival or Zhongqiu Festival is a popular harvest festival celebrated by Chinese and Vietnamese people, dating back over 3,000 years to moon worship in China's Shang Dynasty. It was first called Zhongqiu Jie (literally "Mid-Autumn Festival") in the Zhou Dynasty. In Malaysia, Singapore, and the Philippines, it is also sometimes referred to as the Lantern Festival or Mooncake Festival. It is celebrated on the 15th day of the 8th month of the Chinese calendar. In the Gregorian calendar this translate to September or early October. This year Mid-Autumn Festival will fall on 12 September. This is the time when the moon is at its fullest and roundest. To celebrate the festival, mooncakes symbolizing the moon, is eaten and enjoyed by many Chinese around the world. Other than eating mooncakes, carrying brightly lit lanterns, lighting lanterns on tower or floating sky lanterns is also practised. As a child, I remembered enjoying this period as we get to pester our parents to buy us paper lanterns. The lanterns would come in various shapes and myriad of colours representing animals such as rabbits, birds, butterflies and dragons. The lantern will have a wire to hold a lighted candle and we would parade with our lanterns around the neighbourhood after dinner. All the kids would congregate together playing and the adults would be sitting on the front porch munching on mooncakes and sipping tea. Such delightful times! 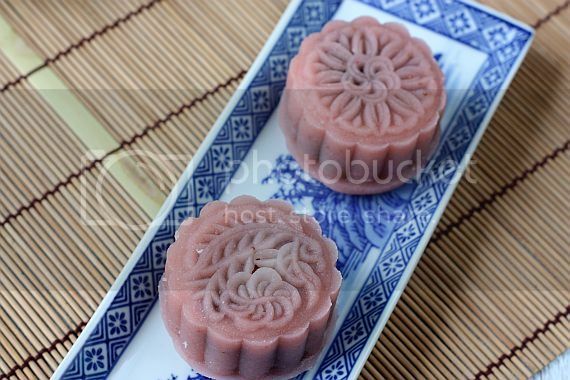 1) Lotus Seed Paste: Rinse lotus seeds and drain. Mix it with alkaline water. Pour adequate hote water over lotus seeds and cover it for 15 mins. Remove hot water and rub off the skin and rinse. Cook the seeds with enough water to cover the seeds until soft. Once soft, cool slightly and blend until smooth. Cook 30g sugar and 1 Tbsp oil in a pot until golden brown over low flame. Add blended lotus seeds, remaining sugar, maltose and oil and mix gradually until incorporated. Then add potato starch and mix well. Remove from heat to cool and leave outside overnight. 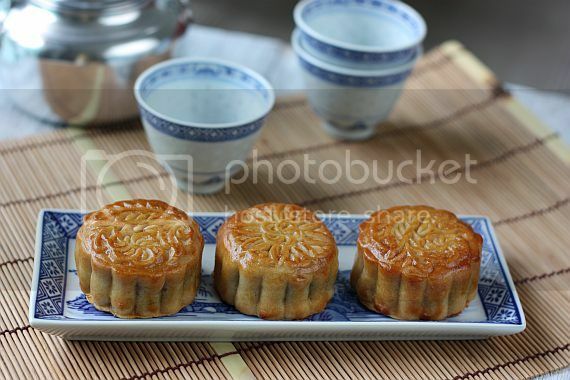 2) Mooncake Pastry: Mix golden syrup, baking soda and alkaline water with oil. Stir until well blended. Sift flour and add in 2 batches to the liquid. Mix well after each addition of flour. Set aside for half hour. 3) To Assemble: Weigh lotus paste into 140g each. Flatten into a round and place the egg yolk in the center. Wrap the lotus paste around the yolk and shape into a ball. Weigh mooncake dough into 40g each. Flatten into a round and place the lotus paste in the center. Shape into a ball. Dust the ball lightly with some flour to prevent it from sticking to the mold. Then press into the mooncake mold. Tape lightly to de-mold. 4) Arrange mooncakes on a baking tray lined with parchment paper. Bake in pre-heated oven of 180C for 15 mins. Remove from oven and brush all over with egg wash. Leave aside for 15 mins and then continue baking for another 8 - 10 mins until golden brown. Remove and set to cool. 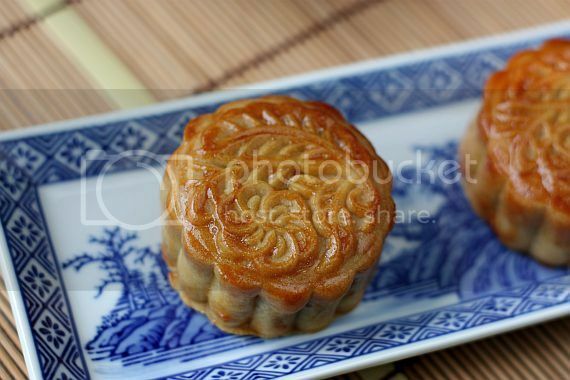 5) Once cooled completed, place mooncakes in a container and leave for three days before consuming. 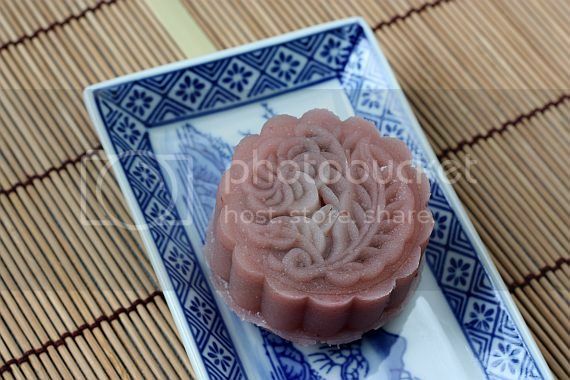 The oil from the mooncake will slowly seep out resulting in a softer and shiny pastry. 1) Add the flour and icing sugar into a clean bowl. Stir to mix. 2) Combine the puree, water and oil in another bowl. 3) Pour the liquids into the flour and mix well in one direction only. Do this quickly otherwise the snowskin will not be smooth enough. Knead for 20 seconds and form into a ball. Roll into a sausage shape. 4) Divide the snowskin into four equal pieces and set aside. 5) Divide the red bean paste into 45g each. Flatten each ball and place a strawberry in the center. 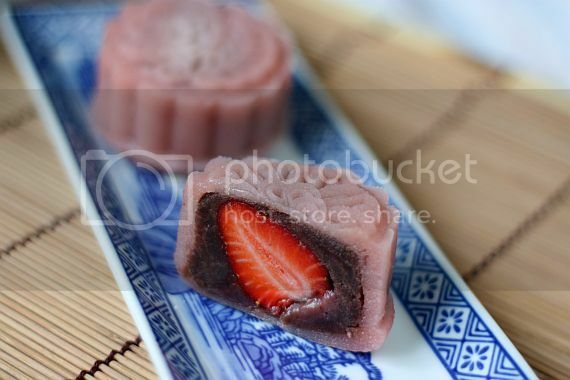 Wrap the red bean paste around the strawberry and shape into a tight ball. 6) Flatten the snowskin and then place the red bean ball in the center. Wrap the snowskin around the red bean ball and roll into a smooth ball. 7) Dust the snowskin with a bit of the rice flour before placing into the mould. Press into mould. Tap lightly to remove. Chill for at least 3 hours before serving. Snowskin can be kept in the fridge for about 3 - 4 days. You can freeze for up to 2 weeks. Remove from freezer a day before serving and place in the fridge to defrost. Jo, I wish I had thought of this... this is like the Japanese strawberry mochi. Love the recipe- without the use of crisco. Will bookmark this for next year. Shirley is right. This is one great recipe. Me too will bookmarked this for next year. Wish you a happy 中秋节! To celebrate the festival, mooncakes symbolizing the moon, is eaten and enjoyed by many Chinese around the world. Other than eating mooncakes, carrying brightly lit lanterns, lighting lanterns on tower or floating sky lanterns is also practised.Dog Waste Bag.. Happy Mid-Autumn festival to you. I feel like want to make your snowskin mooncake immediately as I dislike eating raw shortening. By the way, do you think I can replace the dried rice flour with cooked glutinous rice flour as I still have some leftover. I love the idea of putting fruits in the filling of the snow skin mooncakes instead of egg yolk. I am never a fan of it. Happy Mooncake Festival to you and your family. Hi Shirley, Edith, I find that this snowskin recipe taste better and the skin is really soft. I don't particularly fancy the taste of crisco. Hi Sonia, glutinous rice flour works fine. Thanks for asking the quesstion as I have added this bit to the recipe now. Happy Mid-Autumn Festival to all. Jo, I just can't stop admiring that snowskin strawberry mooncake...drool! Hahaha! Will try making it next year. ;) Have a wonderful Mid-Autumn Festival friend! I did not care much for traditional mooncake when I was younger as I prefer the new varieties then. Now I only like the traditional version - lotus paste with yolk. This is honestly one of the coolest things I think I've ever seen. Thank you for the inspiration. Although I don't quite uderstand snow skins and how mooncakes are made, I'm in awe of how beautiful they are and want to try one so bad. Love the strawberry one..it looks like a little jewel encased in the bean paste. I vaguely remember seeing a Moon festival in China Town as a little girl..I still have the paper lantern :) Oh..also, your photos are stunning! I love both traditional and fusion mooncakes. Well done! Wow, look ridiculously good. You did a beautiful job! The moonies are very nicely made - both baked and snow skin! Shirley is abosolutely right. This is one good recipe. Thanks. Thanks for sharing this recipe. Could you tell me what is the size of the mould you use for this recipe? There is 50g, 63g, 83g mould. I don't know which one to use. May I also confirm that the amount of flour needed is just 37.5g? It seems very little. Also, I saw another recipe that requires the glutinous rice flour to be fried on low heat first before mixing. From your recipe, it seems this is not required. 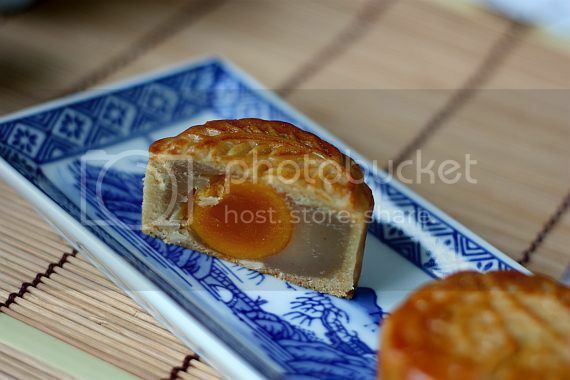 Hi, I stumble upon your blog and saw your post on mooncakes. I am looking around for a recipe that does not use shortening as I really do not like the idea like the rest of the bloggers here.Thanks so much for sharing. I will try this. But one question - when you bite into the strawberry, will it taste sour? I am just afraid that the tangy sour taste will be kind of odd for this sweet combination. Hello, thanks for sharing the recipe! for the strawberry puree, did u use store-bought one or u puree it yourself?